Ancient culture and a distinctly South American aura of mystery draw travellers to Bolivia. Remote, rugged and sometimes overwhelming, this destination belongs on every adventurer's bucket-list. Bold visitors will not be disappointed, whether they gravitate towards the Amazon Jungle's sweaty splendour, the vast emptiness of the world's largest salt flat, or the towering height of the Andes. Bolivia also commands respect for its cultural and spiritual wealth. Culture lovers can immerse themselves in ancient Aymara, Tiahuanaco and Inca civilisations. In fact, Bolivia has one of Latin America's most concentrated indigenous populations, with many people still embracing the beliefs, rituals and lifestyles of their ancient predecessors. Bolivia boasts a great variety of landscapes and altitudes, making climate extremely variable, depending on the region. Winter (May to October) is the dry season and the most popular time to visit. That said, travellers should base their decision on when to visit on their desired activities (the desert and highlands become extremely cold during the winter months). Read more on Bolivia's Climate and Weather. -Explore Lake Titicaca, the highest navigable lake in the world. -Visit the resort town of Coroico, traversing the infamous 'Road of Death' to get there! -Marvel at the bizarrely beautiful Salar de Uyuni, the largest salt flat in the world. -Follow the trail of Butch Cassidy and the Sundance Kid from Tupiza. -Begin an Amazon adventure from the frontier jungle town of Rurrenabaque. -Climb the imposing Huayna Potosi. -Tour the primitive and fascinating Cooperative Mines of Cerro Rico. -Trek through the beautiful and diverse Amboro National Park. There are limited direct flights to Bolivia from the US, out of Miami and headed for La Paz. However, there are no direct flights from the UK. Indirect flights are available and most commonly land at El Alto International Airport, eight miles (14km) southwest of La Paz, and Santa Cruz Viru Viru International Airport, in Santa Cruz de la Sierra. Get more information on Bolivia Airports. The Bolivian Diary of Ernesto Che Guevara by Ernesto Che Guevara, The Night by Jaime Saenz, and Whispering in the Giant's Ear by William Powers. Emma Junaro, and the band, Octavia. Butch Cassidy and the Sundance Kid (1969), Che (2008), and Quantum of Solace (2008). Singani, Bolivia's national drink, and energising coca beer, called Ch'ama, which helps locals and travellers overcome altitude sickness. Salteñas (savoury pastries filled with meat and vegetables) are the national dish, and both escabeche (pickled vegetables) and quail's eggs make delicious snacks. Assorted handicrafts are the best Bolivian souvenirs, with different regions specialising in different skills. Popular buys include ceramics, silver and tin trinkets, and textiles. Medication for altitude sickness is a must for many travellers. Visitors should not underestimate the hot Bolivian day or the cold Bolivian nights. -La Paz and Potosi are some of the world's highest cities. 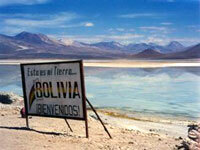 -Bolivia has incredible cultural diversity, with over 30 indigenous languages. -Bolivia is also one of the most biodiverse countries in the world. Striking landscapes, fascinating local traditions, and low prices make this challenging destination more than worthwhile.